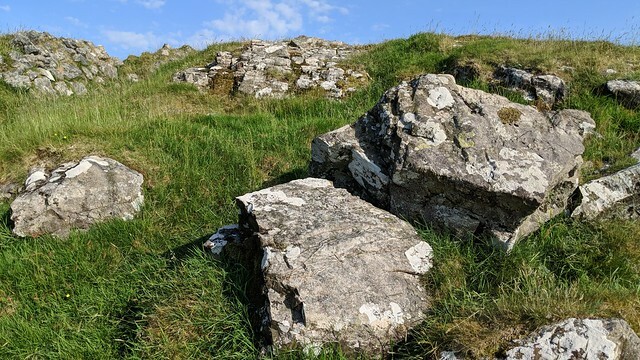 I would loved to have experienced the West Okement Valley in its former state. Sadly, I have yet to see a single photograph that presents it as the wondrous location that those who do remember claim it to be. The river, from source to Vellake Corner (arguably its best section) has not been affected, and the lower reaches below the dam had already been heavily quarried a long time before construction. 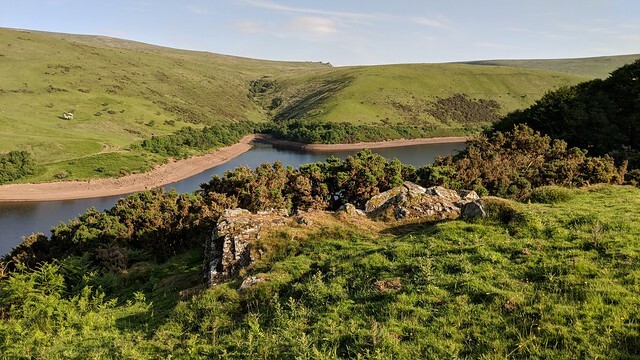 Whilst still impressive, the reservoir affects the visual height of South Down and surely it would have been a more dramatic mass before the valley floor was lost below the waterline. 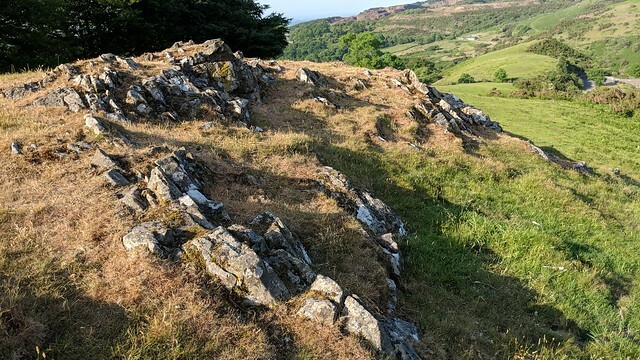 South Down itself, when you look closely, possesses numerous modest emergent outcrops, barely breaking the surface, but visible evidence of a line of metamorphic rock that can be followed from the spur beside the dam wall to beyond the southern extremities of Sourton Tors. I'll admit their stature makes me reluctant to name the ones I encountered, but for the purposes of describing them in this post, I have done so. 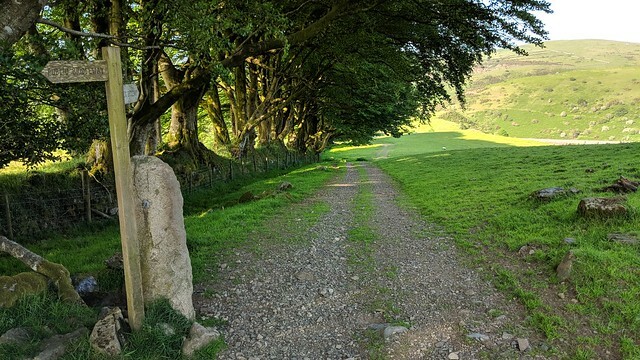 Please note that the main bulk of South Down, to the south of the spur, is on private land but the bridleway running along its west flank is not enclosed. At the northern end, just above the dam wall, there is its most spectacular section; a spur that has been separated from the rest of South Down, by the access road to the reservoir. This section provides an opportunity to see the geology beneath the down, with a huge exposed cutting just before you cross the dam wall. 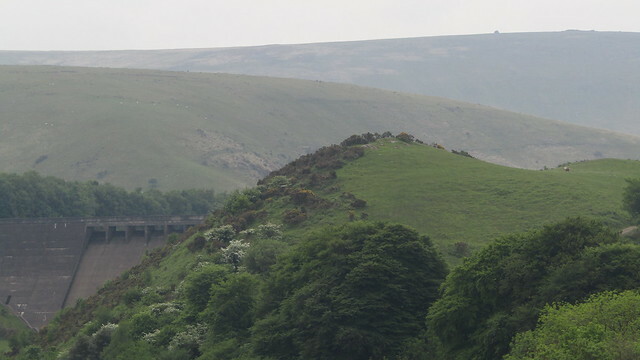 From Meldon Viaduct, looking back to the dam, you get a good view of South Down (spur). The mound is right above the car park and easily accessed. 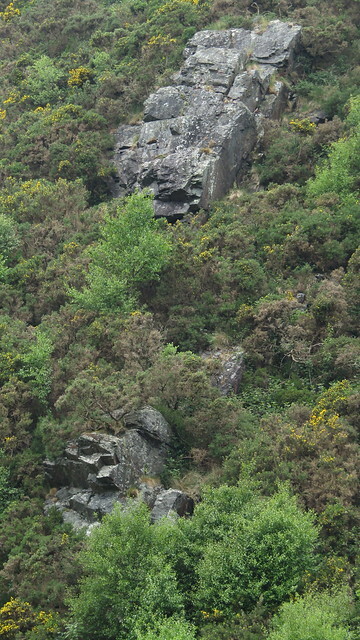 On its summit, there is exposed rock, albeit very low. From this vantage point, you see further exposure across the down as it drops then rises in a south-west direction. 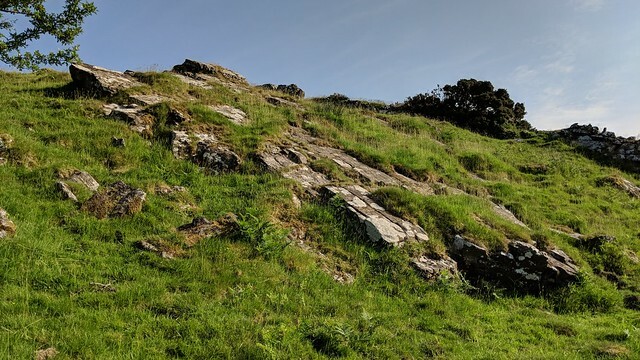 Whilst the outcrop on the summit of the spur is of little merit, its better outcrops jut from the steep slopes above the West Okement, the remnants of a huge ravine. To reach them is difficult, I tried and I wouldn't recommend it, especially when they are best viewed from both the dam and the opposite slopes. 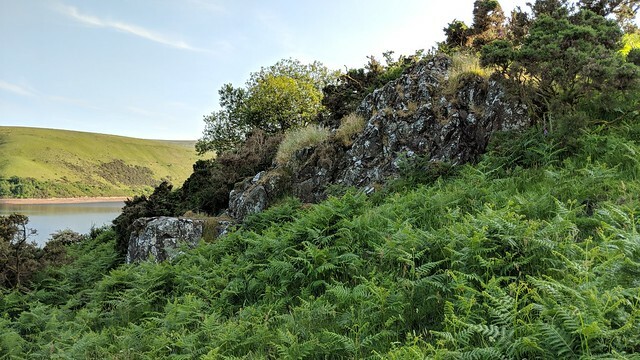 Standing below on the left bank, looking up, you see an overhang that appears tantalisingly within reach, but the combination of bracken, gorse and gradient make the route perilous. 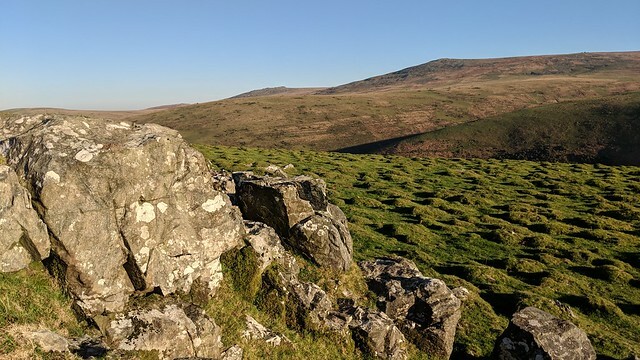 A small collection of metamorphic outcrops can be viewed on the grassy north-east slope of South Down with wonderful views over Meldon Reservoir and the gorge. Starting from highest to lowest; follow the line of trees from the footpath, up onto the ridge where can be seen outcrops at grid reference SX 5591 9150 (altitude 305 metres), which are larger than the rather disappointing summit. 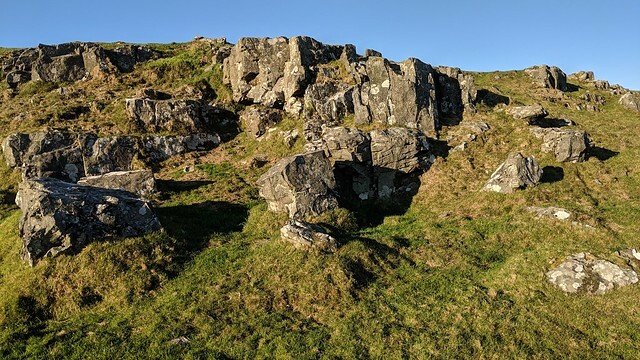 The middle section is some 10 metres lower in height at SX 5600 9160, comprising of two scruffy low patches of bedrock close to each other on the ridge line. Hiding off the ridge, some 15 metres lower still at SX 5609 9165, is the best of the bunch you can reach. 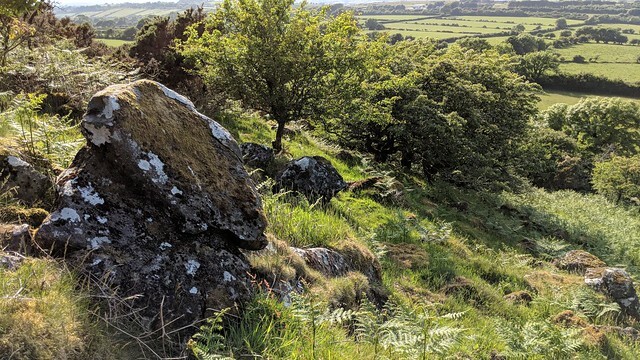 It is the largest and lowest of the outcrops on the ridge of South Down. 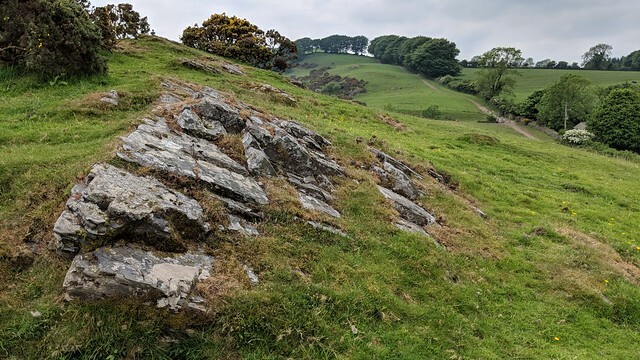 It sits just above the track that led to the old permissive footpath that made a circular walk around Meldon Reservoir possible before it was barricaded off. 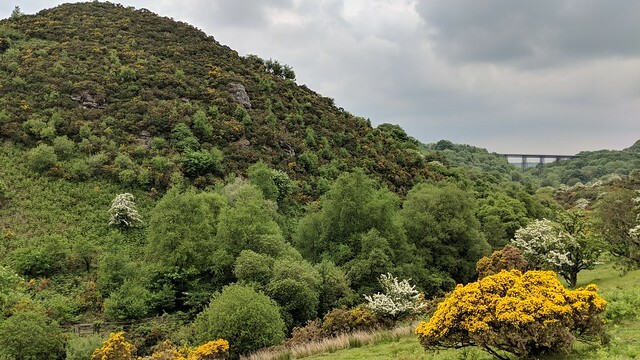 Whilst the three sections can be visited all year, they are best viewed in the winter months when the bracken has died down. 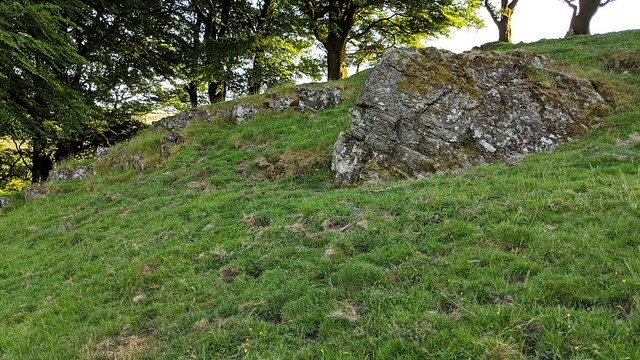 Just off the highest point of the down, and either side of a ruined wall, this section has low exposed rock and fragmented boulders. 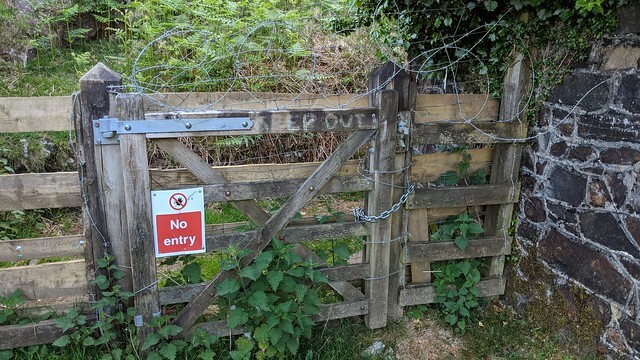 Hard to believe it has been over seven years since the path along the western side of Meldon Reservoir was closed off to the public when an access agreement between Dartmoor National Park Authority and the landowner ended. It's a shame because this permissive path, which went from Vellake Corner to the car park, created a very pleasant circular walk around the reservoir of about three and a half kilometres. 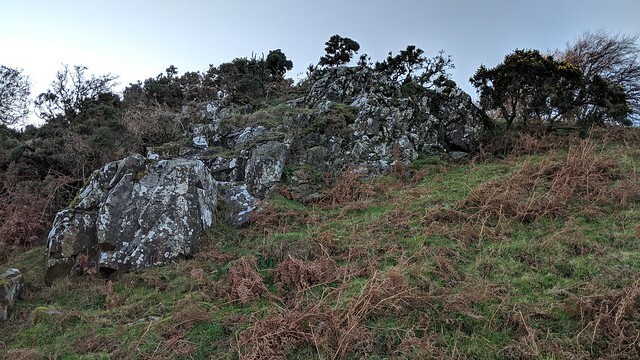 Those who remember it, as I do, will know that half a kilometre along its route, you passed under a large outcrop and fallen boulders at about SX 5568 9094. 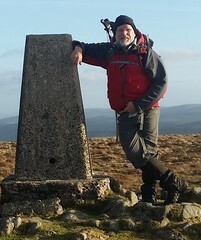 For the purposes of this post I have called them South Down (south-east). If only I had taken a photo back on the couple of occasions I walked it. 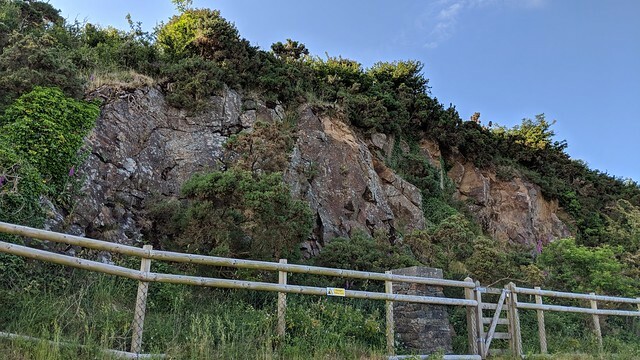 Nowadays, the only legal way to view the outcrop is from the slopes of Homerton or Longstone Hills on the other side of the reservoir. And finally, we come to the last outcrop in this post. 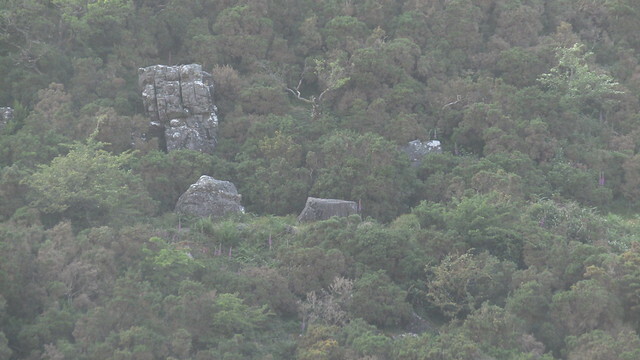 The presence of someone I took to be tending the cattle deterred me from visiting the summit when I passed below on the public footpath, so my only view of this scruffy pile was from a field boundary wall about a kilometre to the south. I went back for a closer look a few weeks later.